Posted by Ada Wang on 1/4/2019 3:07:31 PM. 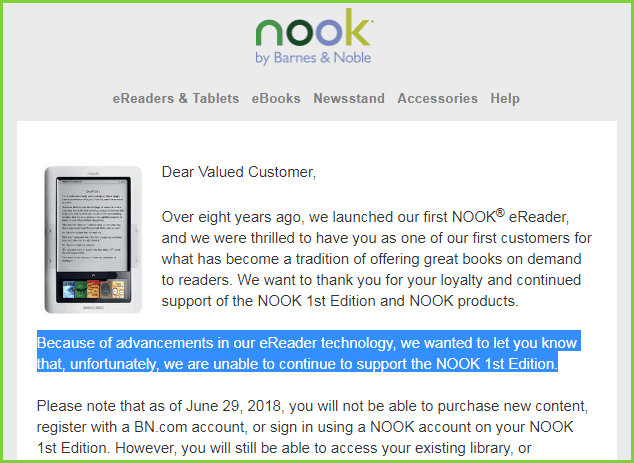 As what the image shows that, B&N has started sending out emails to customers that they will cut off the supporting the 1st generation Nook as of June 29. What does this mean? You won't be able to buy books from B&N any longer on your first generation Nook device! I've paid money for the device and contents why I don't have the right to control them? You may feel angry like me but here I want to let your know that the perfect solution for this is to back up Nook books! Except Amazon and Kobo eBook stores, Barnes & Noble is also one of the popular eBook retailers on the market. If you are a big fan of Nook books, I guess you must have got a lot of Nook books at hand. When reading these purchased or downloaded Nook files, have you ever thought about the safety of them? Are you worried about that your Nook books will disappear someday? And you cannot redownload and open them at all? In fact, we cannot guarantee the downloaded Nook files are 100% safe, Nook may delete our Nook content without any explanation. But what can we do to ensure we won't lose them forever? Obviously, the best way is to backup Nook books and save a copy of them on our computer. Why we need to backup Nook books? As I have mentioned, our purchased Nook files are not completely safe, like Amazon or Kobo eBook store, Nook files are also saved in "Cloud" server of Barnes & Noble. How can we make sure it won't have any problem? Or it won't delete our Nook content without any notice just like the true story that Amazon deleted one of its user's books without saying a word? To protect our downloaded Nook files, it's essential to backup Nook content. Besides, we cannot guarantee Nook eBook store will be running in a good condition forever, backup Nook files is a wise choice in case of Barnes & Noble will close down some day. It's not hard for us to find out that most of downloaded Nook files are DRM protected. How to backup Nook books? You may said I can sync them via Nook app, then copy them to another folder of my disk. But if Nook have deleted your Nook content, when you tried to open the stored file, you may cannot open it at all as Nook tells the server you are not the owner of the book. Because of DRM, it's impossible for you to view the saved Nook files. So removing DRM and make a copy of DRM free eBooks to your computer is the best way to backup Nook files. Thus, an eBook DRM removal tool is needed. Here I recommend the professional eBook decryption tool Epubor Ultimate for you. 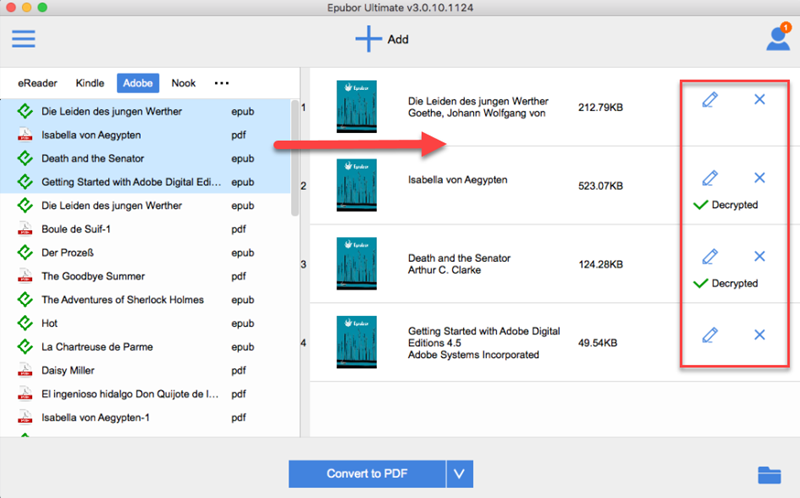 It's an all-in-one eBook tool, which contains both DRM removal and eBook conversion functions. As far as I'm concerned, it's one of the most powerful and handy tool I have used. If you are searching software to remove DRM from Nook files, why not download it for free trial? Before removing DRM from Nook files, there is one thing we must know that Nook books can be protected by 2 kinds of DRM scheme: Adobe DRM or Nook DRM. Download Nook for PC or Nook for Mac and install it on your computer. Updated 1/4/2019: Nook company has discontinued the Nook for PC and Nook for MAC. We recommend you download Nook books via Nook app get from Miscrosoft Windows store. Then download Nook books via Nook app. Sign in Nook app with your Nook account and sync purchased Nook files via it. Run Epubor Ultimate and fill in Nook account information at first. Please click on "User" icon-->>Settings-->>Nook-->>input your Nook account information. Then go back to the main interface of Epubor Ultimate and then drag & drop ebooks to the right column. DRM will be removed successfully. Download ADE and install it on your computer. Authorize ADE with your Adobe account and make sure you can read Nook books via it. Launch Ultimate to remove DRM. 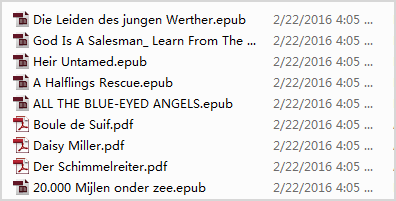 After we have removed DRM from Nook books successfully, simply click "Open Folder" to check your decrypted Nook files. If you need to convert decrypted Nook files to Kindle format, you can also use the tool I mentioned above to convert the format. 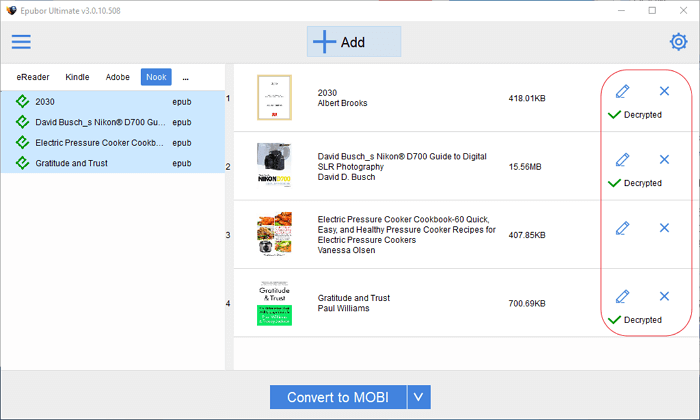 Simply choose "Mobi" as output format, click "Convert" button to start conversion. Now simply copy these files to your computer disk and save them forever. No need to worry about losing them anymore. If you are interested in backing up Google Play books, please read this guide How to Back up Google Play Books. Could you send "step by step" instructions on how to accomplish moving Nook Books to a laptop. Also is it possible to move the "nook" files to an external hard drive and use the external hard drive as a library? And is it possible to continue purchasing from Nook and transferring to the external hard drive. Can a device be interfaced to the hard drive to bring up a certain selection? I ask these questions as one who is not technically savvy at these things do any help will be greatly appreciated. Also do you have info on how to setup an online radio station or podcast ? I keep seeing posts where you say to download nook books with the Windows Nook for PC app but HOW do you do that? When I download them into my app and then sync, they are still not on my hard drive. How do you get them from the app to the hard drive? Thanks.